The previous installment of this post, Lightroom Adjustments: Exposure vs Brightness was featured on the facebook Lightroom page and brought a very large number of visitors to this modest site. Over 5,000 visits and more than 8,000 page views were exceptional numbers for Kept Light. Also, comments and questions both on this site and on facebook nudged me to continue the investigation and focus on color shift during the exposure and brightness adjustments. I made a color and grayscale ramp in Photoshop with carefully applied colors and grays. The purpose was to see if the saturation or the hue would change differently under different adjustments. The sample was imported into Lightroom and I took careful measurements of each patch in Lightroom. 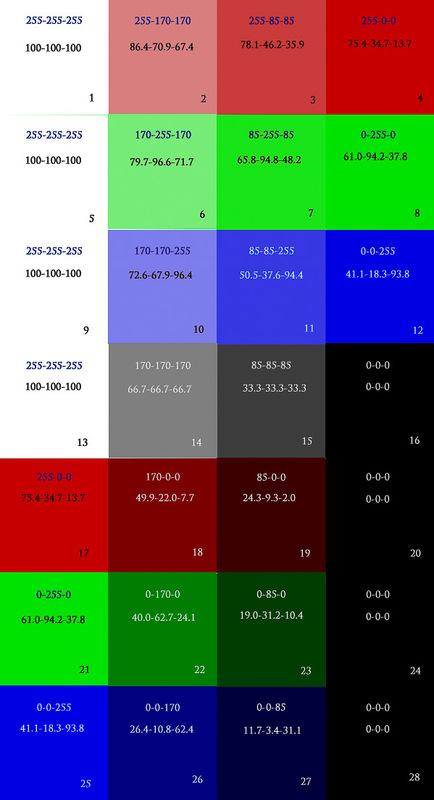 The top row of numbers in each cell represent Photoshop RGB values in which each color changes from 0 to 255. The second row of numbers are the Lightroom measurements where each channel has percentage values that range from 0 to 100. The first thing that is very easy to observe is that Lightroom color model is a good deal different from the Photoshop RGB model. In the Photoshop color formation, there is a clearly visible pattern, like 0-0-255 and 0-255-0 which are linear relationships. Increasing the red from 127 to 255 will max that channel and double the Red value. The same behavior will be observed on the green or the blue channels as well. In Lightroom color model this kind of pattern is simply not there; different hues are formed by a different formula as you can see in the percentage numbers. The only place where the pattern based behavior is visible is on the grayscale patches. The second thing that is worth observing right away is that the luminosity values for each color and each patch are interpreted differently in Photoshop and Lightroom, further supporting the idea that the color models are substantially different. Take a look at the two grayscale versions of the target done in Photoshop and in Lightroom by reducing the saturation to zero. You will notice that the gray values coming from Photoshop produce the same tonal values for patches where the amount of R, G, and B are similar like 0-0-255 and 255-0-0 producing identical gray tones. The situation is a good deal different in Lightroom. When desaturated, the color patches show different levels of brightness that will probably explain some of the later observations. In other words, “greens” are “brighter” than “reds” which are “brighter” than “blues”. I proceeded to apply one adjustment at a time, exposure -2, -1, +1, +2 and brightness -100, -50, +50, +100 and recorded the Lightroom values in each square on the test chart. These numbers along with the original readings were entered into an Excel spreadsheet. Since I wanted to see the “change” in the value of each square I calculated the difference between the adjusted values and the original values to produce the bar charts you will see below. What is not easy to see in the bar charts will be a good deal easier to see when you look at the test image with each adjustment applied. The last set of images are quite informative, albeit in a subjective way. It is easy to see that “darkening” an image using exposure or brightness is a forgiving adjustment regardless of the adjustment tool used. However, when “brightening” the image, exposure adjustment creates serious hue shift in greens and blues. This is particularly easy to see in the fourth image, Exposure + 2. On the other hand, the brightness adjustment retains the hues fairly faithful to the original values and displays a more “expected” result. None of the brightness adjustments, under or overexposing the image causes any subjectively visible hue shift in any of the patches. The exposure adjustment moves the values in the channels reasonably close steps. Consequently, it quickly runs out of room on a channel where the starting value is high to begin with. After reaching 100% on that channel, Lightroom continues to increment the other channels to provide the exposure increase. On the other hand, the brightness slider is far more judicious in its steps and somehow manages not to run out of head room in any of the channels as the level of brightness is increased. Consequently, it avoids the hue shift that quickly emerges in the exposure adjustments. The reason neither adjustment causing hue shifts in “darkening” the image must have to do with the ample head room in each channel for decreasing values. The empirical observations and visual cues and clues indicate that if a photograph needs serious upward adjustment of the “darkness” the brightness slider may be a better starting point. (I used “darkness” to avoid referring to either of the adjustment sliders directly.) For modest adjustments, or to darken the image either slider seems to produce similar results. I would liken the brightness slider to the behavior of a curves adjustment layer in Photoshop after changing its blend mode to “Luminosity.” In fact, if an image needs that much adjustment in the upward direction making that adjustment in Photoshop may offer additional flexibilities. In addition to changing the blend mode of the curves to luminosity, I can also use the “blend if” sliders to further adjust how each channel may be affected by adjustment or use layer masking and the like. It would be awfully good of someone who knows the inner workings of Lightroom to provide better explanations of these adjustments. My curiosity brought me up to this point. I hope that this installment provides a little better understanding of the color shift behavior others seem to allude but not explain. Here at least you have visual clues as to the impact of these adjustments on color shift and some measurement results charted. I appreciate your thoroughness in following up on your previous posts. Often, in RAW, I try the auto function for experimenting with the software’s interpretation of proper lighting. The software tends to rely heavily on the exposure slider and reduce the brightness slider to 0 +-10. My instinct is to reduce the exposure change to under .5 a stop and boost the brightness. Over time I’ve found that boosting exposure more then .5 stop increases the noise. When I first discovered the localized adjustment tool (in RAW) I got a bit heavy handed & caused myself headaches over increased noise issues in the areas altered. I’ve found the graduated filter much more useful – I often shoot in strong light and use the graduated filter to bring out the shadows – minimal to zero noises issues using this approach. Your tests and discovering the color shifts using exposure adjustments vs. brightness is useful information and something to add to my arsenal of processing tools.